Earlier fake news was published in newspapers, now it has gone digital. These days people are busy forwarding messages on Whatsapp. Fake news is a lot more prevalent on WhatsApp than Twitter in India, this is mainly because of the reach of Whatsapp in India (over 200 million users). A trusted sharer results in more trust for the article, which means you tend to believe what your friends share on social media. Users make no effort to crosscheck if the news is for real. Forwarding jokes are one thing, but forwarding fake communal messages is another. These days people forward very old messages as current events and it is very easy to believe it happened recently. See this, this and this – all packaged for the Karnataka Assembly Elections 2018. Even when a piece of news is busted as fake and a lot of people share the correction, it is unlikely to reach even a small fraction of the number of people who have come to accept the initial fake news as fact. Advertisers are now forcing big media houses to control fake news, else advertisers will pull out. Readers are more likely to distribute vivid stories that inspire emotion — such as fear (polluted rivers), disgust (child labor), and surprise or delight (32-hour workweek) — than stories that are flatly recounted. Technology is a double edge sword. Social media is a perfect platform to spread news, real & fake, to a huge user base “quickly”. Automated accounts are being programmed to spread fake news. Facebook and Twitter bots help you to increase the “shared signal” of news articles quickly. They do this by liking/retweeting a post/tweet from several fake social media accounts. People tend to share articles that are going viral on social media. A study by Indiana University in Bloomington showed accounts that actively spread misinformation are significantly more likely to be bots. Social bots play a significant role in spreading fake news, which goes undetected to a normal eye. Bots alone cannot do this job. It is important the news item passes through highly connected nodes (influential users) on social media. They can achieve this only by targeting and reaching influential users. They direct these messages to influential users with the hope these users will share it, which in turn increases the credibility. Recently, Shashi Tharoor shared a fake news item and people almost believed it. Bots these days are being used to influence voters during elections. Familiar fake news had a higher perceived accuracy rating than unfamiliar real news. In other words, if a fake story goes viral on social media — as they often do — people may perceive it as more accurate simply because it’s flashing across their screens so frequently. The most popular messenger platform in India is Whatsapp. With a 200 million reach, it beats Twitter black and blue. Majority of forwards on WhatsApp are non-verified. Users most often say, “I am tired of telling my mom not to forward fake news”. WhatsApp’s foundation has been to keep the app simple. But I strongly feel they have failed in adding features to control conversations in WhatsApp groups. I am currently struggling to get out of my UG group as one of the members keeps posting communal content. WhatsApp may start labeling messages as Spam / Fake News. User’s consent required before being added to a group (opt-in instead of shoving down the throat). Facebook does delete fake news, sensitive photos from everyone’s timeline. Since WhatsApp is an FB company, why can’t they use this knowledge base and do the cleaning on WhatsApp? Provide a way to flag a particular message as fake news or false narrative. Few sites in India have been identifying fake news. But yet to see anyone exclusively focusing on false narratives. Boomlive.in: Facebook partners with Boomlive to bust fake news, even though they have given their own guidelines to identify fake news. Hoaxy visualizes the spread of articles online. It tracks the social sharing of links to stories published by low-credibility news sites and fact-checking organizations. Snopes.com, founded in 1994, has come to be regarded as an online touchstone of research on rumors and misinformation. PolitiFact focused on looking at specific statements made by politicians and rating them for accuracy. PolitiFact is run by the editors and journalists. While most fact checkers refer Wikipedia to cross-check the facts Wikipedia hacking has become a problem. You can install any of these add-ons which may help you decide to continue using a particular website. Their algorithms determine the credibility factor of the site. Newstrition: The Newseum, Freedom Forum Institute and Our.News partnered up this year to create a similar browser extension, which provides more context and related fact-checks about specific websites. NewsGuard: We tell you if a news site is reliable—right in your browser. VettNews is a rating agency of news organizations and the first complete solution to tackle the problem of information pollution, misinformation and hoax news. Expected to be launched in Oct 2019. While the sites mentioned are working on identifying fake news, you will agree, the model is not scalable. There is too much content that is being published every day – online, social media, WhatsApp. Technology is trying to identify fake news (not narrative) but it is not able to do much for content in Indian languages. However, an algorithm or technology cannot identify a false narrative. This paper from IIT Delhi talks about controlling rumors by using anti-rumor messages. 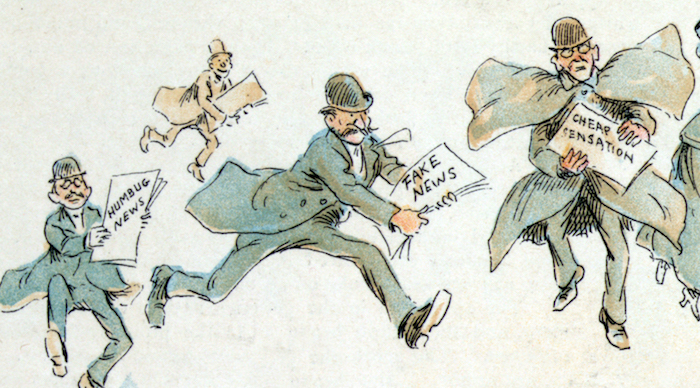 Anti-rumour is a message like any other in a social network, except it is sent with the express intent of debunking a rumor. This can be done using two models – beacon model & neighborhood model. Govt of India is proposing social media cells around the country to monitor content, this fits into the beacon model. Can blockchain help in solving this problem?